Director, RCP Infratech Pvt. Ltd.
Did you know that over 50 million businesses in India use Facebook Marketing for their business? It is one of the fastest, easiest and cost-effective way to promote and market your business. Believe it or not, Facebook Marketing when done strategically, can help you achieve business goals within as less as 15 days! With a limited budget, you can test, try and then spend. As per statistics, 67% of the Facebook users are from Tier 2 and Tier 3 Cities – which is contrary to popular perception. Breaking the stereotype perception, Facebook Marketing has proved to give spectacular results for almost every form of business, from Educational Services to Real Estate to Hospitality and even Health care. Usually buyers look forward to a more personal buying-experience on high monetary value purchases. For B2B businesses, Digital Marketing poses greater impact on Branding and Lead Generation and does not directly impact sales. How did we execute it for our client? Utilisation of Digital Marketing Platforms in Real Estate sector has resulted in remarkable increase in the number of quality leads. The property sellers get abundant opportunities to convert the potential audiences into future clients. RCP Infratech Pvt. Ltd. works to develop high-quality real estate projects in Raipur. Their project VIP City which is the first integrated township of central India offered ultra-modern amenities and panoramic views to their customers. Apart from building houses, they also help purchasing it by providing financial assistance. They’ve been awarded by State Bank of India, for providing exceptional assistance to customers when it comes to housing loans. With this information we had to proceed with their branding. Earlier, RCP Infratech advertised its projects only through newspapers right before their launch. Being aware about us as the leading digital marketing company in Raipur, they approached Konsole Group to promote and market their project “VIP City” and generate leads for sale of apartments in VIP City. Being a Real Estate company, all the marketing was directed towards generating leads than on direct conversion. It was a 15-day campaign with extensive branding of the project that gained 723 leads. We targeted people belonging to the upper-middle class in the entire state of Chhattisgarh. This was possible as Facebook is 85% accurate and when further information like age and gender (demographics) is included, the accuracy rate goes up to 90%. Introducing a pair of ‘Robots’ for guests’ welcome at the event for the first time in India. The winner of “My Bid, My Flat” was announced on the same day by Mr. Rakesh Pandey, Director of RCP Infratech Pvt Ltd. This was the introductory post of the campaign that targeted high engagement for the upcoming campaign. We even collected 26 leads on the very first post. Post unveiling the idea of bidding a flat that was organised for the first time in Chhattisgarh. Also, 15% discount on 23 other flats was offered by them. We ran two campaigns with a motive to provide adequate details regarding the flats and accumulate leads. Vernacular ads are your best bet when it comes to lead generation and marketing your brand. We emphasized on using Hindi language more in our posts in order to connect well with the audience of Chhattisgarh. Guests at the MyBid – MyFlat event were welcomed by Robots – OKIRO & OHAYO. We achieved tremendous engagement with this post which also created buzz, for sure. 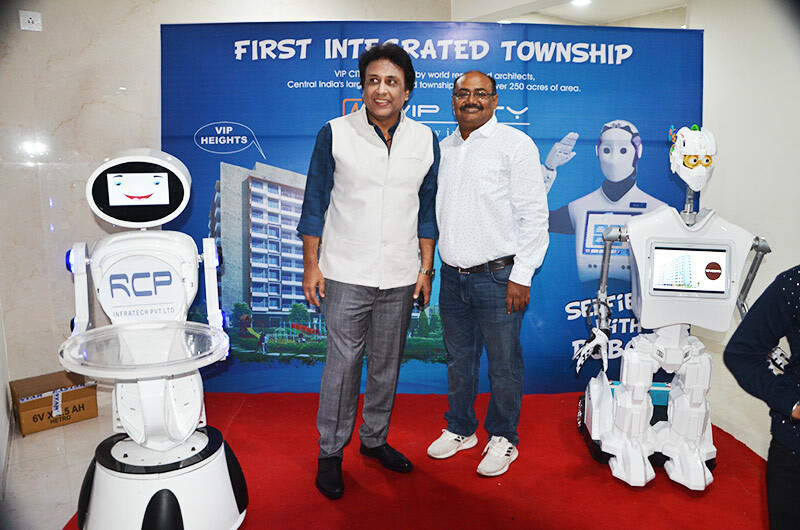 Embracing the fantastic opportunity to create further excitement about the aforementioned event, we decided to come up with a contest – Selfie with Robot where guests had to click a selfie with robot at VIP City and top 3 clicks with maximum likes were to be awarded with attractive prizes. Last communication was made targeting the interested buyers via above post. As a result, the Facebook Marketing campaign helped us yield 723 leads with a reach of over 136,894 and impressions upto 255,017, all in just 15 days! And, a complimentary enhanced Brand Image of the company.